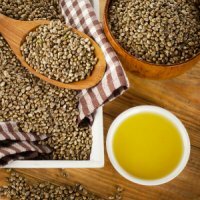 Hemp seed oil could play a role in reducing risk of heart disease and diabetes. Researchers at Ohio State University found men and women with higher levels of linoleic acid, a fatty acid essential to human health, tended to have less fat between their vital organs, more lean body mass and less inflammation. Higher linoleic acid levels also reduced the likelihood of insulin resistance, a precursor to diabetes. The team’s research has been published in the journal Molecular Nutrition & Food Research. It’s an important finding as once- common cooking oils rich in high linoleic acid are becoming harder to come by. This is a result of the cooking oil industry’s push for oilseed crops modified to produce oils higher in oleic acid; another essential fatty acid. According to Martha Belury, a professor of human nutrition, expert in dietary fats and part of Ohio State’s Food Innovation Center, the reason for the shift is when linoleic acid is solidified for processed foods, it is more likely to convert to harmful trans fat than oleic acid. One of the many positive aspects of hemp seed oil is it is very high in linoleic acid (LA) Omega-6*; with levels around 43-62%. Today’s commonly available olive oils contain around just 10%. Previous research has found taking as little as a teaspoon and a half of linoleic acid supplements increased lean body mass and lowered fat in the midsection. Up to 35% of the weight of hempseed is an edible oil. The oil also contains other essential fatty acids – alpha-linolenic acid, omega-3 (ALA, 22%), gamma-linolenic acid, omega-6 (GLA, 1–4%) and stearidonic acid, omega-3 (SDA, 0–2%). Hempseed comes from the industrial hemp plant; a cousin of marijuana without the psychoactive properties. In addition to food, industrial hemp has a myriad uses; leading it to be considered as one of the world’s most useful plants. So where do you get hempseed oil for human consumption in Australia? You don’t – unfortunately, it is still banned here. In fact, Australia and New Zealand are the only countries in the world where the sale of hemp food is still illegal. Hopefully, this may change soon.